Take a universe of interactive stories with you. 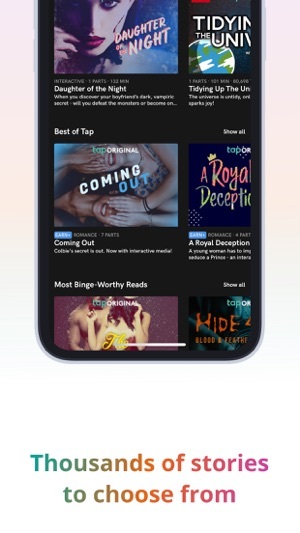 The world tells its stories in many wonderful ways, and Tap by Wattpad is where you’ll find immersive, interactive storytelling. Tap stories mashup mixed-medium storytelling and choose-your-own-ending twists, pulling you deeper into each story with every ‘tap’. The result? interactive stories you won’t want to put down. 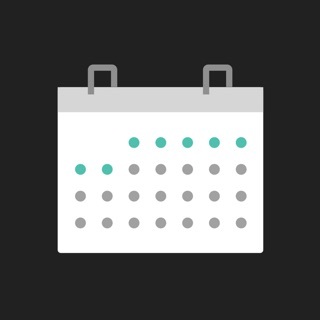 With Tap, you’re the main character of your favorite stories. In Daughter of the Night, find yourself drawn into the morally ambiguous world of vampires. In Marie Kondo-inspired story Tidying Up the Universe you’ll decide: what parts of the universe will spark joy or which will you thank, then destroy? 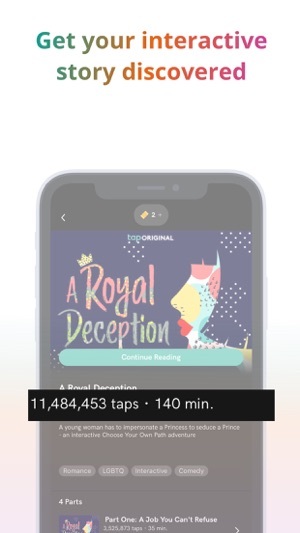 And in A Royal Deception, go undercover as a princess to seduce a prince long enough for him to lose his throne… Tap stories use animated text, choices, video, chat messages, and stunning imagery to create a world of mobile stories that captivate. 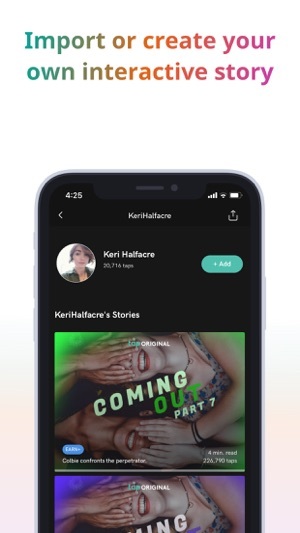 Wattpad has always been the home for diverse creators and their stories. Since 2006, Wattpad has been hailed as a safe and inclusive community for narrative fiction writers and readers all around the world. With Tap, we’re working to build a future where everyone’s world is possible, and all independent games and interactive stories belong. Interested in creating your own interactive stories? 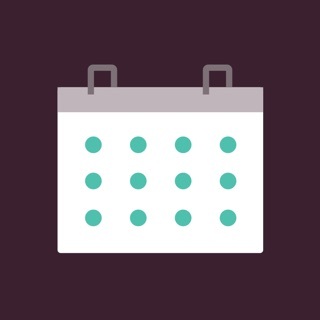 Upload your Twine or create your own stories for Tap. Visit taptaptap.co to join our Tap Beta Creator Program. This is a completely honest review. I would give this app no stars if I could. WATTPAD is one of my favorite apps and I love reading on there, but this app is honestly just a disappointment. First off, when you enter the app it MAKES YOU tap through a weird story about some killer little girl. I'm sorry but that's not why I downloaded the app! I wanted to read something else, but I guess I have to read what they want me to. No problem. So I clicked through it and then a video call came. I was like that's pretty darn cool, but when I tried to accept, The app said I needed to buy premium. ADVERTISING and I wasn't even 5 minutes into the app. ALSO, the prices are insane! I'm sorry but money doesn't grow on trees and some features like pictures should at least be free. I understand the need for funding but please offer some free so i can see if I like it before blowing $8 a month. I don't want to put in credit card info for my FREE trial. So I obviously declined and kept tapping. Then it told me that I needed to wait like 30 mins to continue reading this story that I didn't want to read in the first place. The opening story should only be a tutorial and you should be able to click out of it!! I've only had this app for a bit and ALREADY frustrated but I'm going to keep trying because one of my favorite Wattpad writers is writing on TAP. Unless you are okay to pay for premium, don't download this app. Okay so I saw this app and thought ‘this is gonna be so good, plus its by Wattpad so huge plus’ but no it was all LIES and DISAPPOINTMENTS. The add I saw for it looked really good, so I tapped it and got the app-when It FINALLY downloaded not only was it REALLY slow, but there was not exit button on the story. I thought it was weird but didn't linger on it because I thought I was about to read and awesome story. Im probably about 15 taps in before it presents me with a choice, in which I could not skip-and I couldn't leave the story-but I had to get premium to select a choice. But I cant because money doesn't grow on trees. I understand the ‘you have yo wait 30 minuets’ thing because otherwise there would be no need for a premium and nothing would be gained from the app by the developer, but dont present the app with all those premium things that we average people cant get. At the very least give me an exit button. 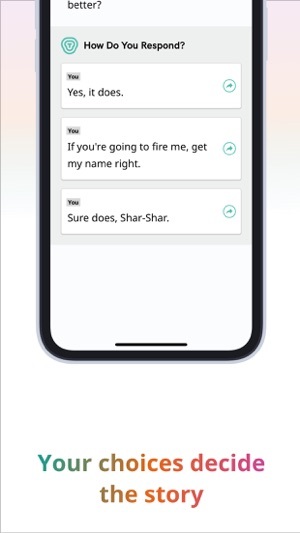 This app was not at all thought out well. There are so many flaws with it. Plus in some of the other comments, I saw something about needing to read some horror story beforehand-not everyone can read horror stories. As a kid I couldn't even watch/read Goosebumps without having bad nightmares. 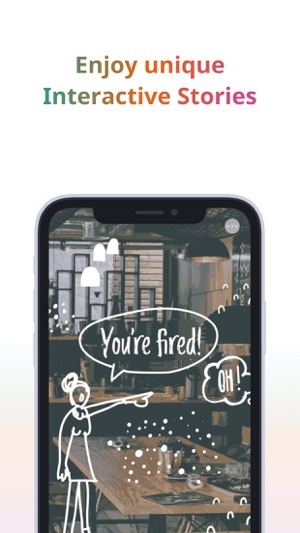 This could be a great app, it just need A LOT of work. A LOT. I don’t know how else to describe this app in one word other than disappointing. I was so excited to download this app; to read stories and to make some of my own. But when you first download the app, it makes you click through a boring story about some murderer girl. That’s not what I want to read! I came to pick my own stories. I figured it was a tutorial and kept going. However, I found that it only got worse from there. It’s not just a tutorial, for one thing. It counts as the first story you read. You have to pay for pictures, video calls, voice notes; pretty much everything that makes the story interesting. And while reading the boring pre-story, you only get 20 taps before you have to wait 30 minutes to tap again, to finish a story you didn’t even get to choose to read! Not to mention, the premium is EXPENSIVE. It’s like Wattpad is trying to burn holes through your pockets. First Wattpad premium, now this fail. It’s disgusting to even think about. 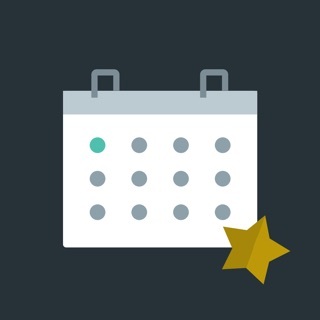 Unlimited & premium stories - try for 7 days!